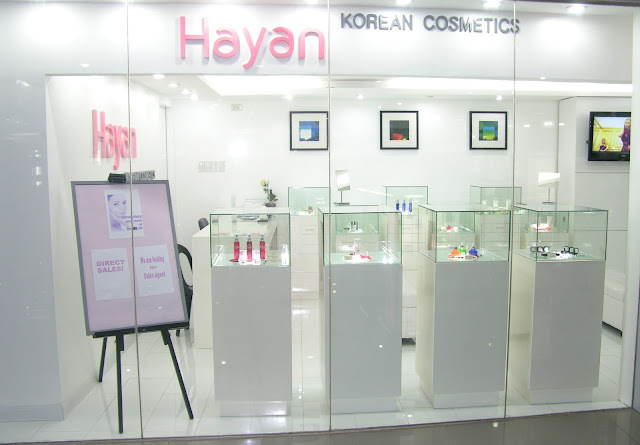 Hayan Korea: Do You Want a Flawless Korean Look, Too? Almost every girl (and girl-wannabe) wishes to have skin as flawless and as perfect as that of Korean actresses. Well then, you should say hello to Hayan Korea and welcome the brand with open arms. After all, Hayan Korea can bring you one step closer to reaching that goal of flawless and youthful skin. Although Hayan Korea Cosmetics Inc. has been in the Philippines for a while now, it isn't until last month that they actually set up a proper operating store. Located on the 2nd Floor of Starmall, Shaw Boulevard, Hayan Korea brings a fresh look to the mall with its girly pink and white colors. In general, Hayan Korea offers some of the most effective and purest skin care products, including facial foaming cleansers, serums, moisturizers, toners and makeup. Thanks to Hayan Korea, every woman can be as beautiful as they want to be. Whether you want to look naturally fair, become whiter, or just keep your skin looking young and fresh, Hayan Korea combines research and expertise to ensure that all of their products deliver the best results and contain only the best ingredients. Oh, another promising Korean cosmetic brand to try :) Thanks for sharing! good to know! i'm currently trying a soap that promises asian princess-like skin, lol! let me know how yo like these! Wow. This is nice. So much information about Korean culture. Maybe we could follow each other on Bloglovin and/or GFC?